“Saving our planet, lifting our people out of poverty, advancing economic growth – these are one and the same fight” said Laura Kelly at the outset of her talk on Shaping Sustainable Markets, setting the scene for a powerful presentation on the fundamental importance of mobilising the private sector into action on the Sustainable Development Goals (SDGs). Kelly first acknowledged the recurrent criticisms of the private sector as proponents of climate change and inequality, yet dismantled the argument that so often follows: that because businesses pollute and have a duty to maximise stakeholder profits, they are the antithesis to progress on environment and development issues. Kelly instead emphasised the diversity of the private sector – from multi-lateral corporations to small scale farmers – and the important social benefits that many bring, such as employment opportunities. Kelly also argued that, because business harnesses such powerful influence, rejecting or excluding them from the fight because of poor environmental, social or governance credentials is not an option. Quite the opposite: it is of critical importance to mobilise the private sector to both mitigate and tackle the ills they have had a hand in creating, through changing corporate practice, new policy directives and enhanced stakeholder engagement. To me, the most significant take away from the talk was an emphasis on the interconnectivity of all actors – private and public – and the interdependency of the SDGs that we must collectively strive for. There was emphasis throughout Kelly’s talk that no SDG exists in silo with another, but that better access to solar panels, for example, can help with higher levels of education – and that these goals can be realised through the development of new conceptualisations of business models, the derisking of innovative ideas and the creation of commercial value through solutions which address poverty reduction, economic wellbeing, climate change and resource scarcity. Ultimately, Kelly’s approach champions tackling environmental issues and addressing development needs from within – making markets and the businesses that operate within them truly sustainable, to work not only for profit, but for people and our planet, too. Lucy Feibusch is an MSc Environment and Development student at LSE, and a graduate of UCL. Her research interests include just transition policies and initiatives: fighting against climate change and for environmental stewardship while protecting vulnerable communities and fostering social development. In most conversations, the private sector is seen as being antithetical to the aims of development. Many argue that at the core of development lies a concern for the larger public, whether that be for the citizens of a country or a global concern for the people. On the other hand, the private sector is, by definition, for private motivations- for profit, for personal gains, for the self. Can the private sector, often governed by large corporate boards and faceless bodies of corporations, help advance the humanitarian concerns of development? Laura Kelly, Director of Shaping Sustainable Markets at the International Institute for Environment and Development, would argue that yes, they aren’t always in polar opposition. In her presentation, Laura argued that with the right influence and incentives, the private sector can create change through their concerns of making sure that businesses last for years to come. To convince sceptics, Laura cites the example of investment firm BlackRock, which redefined company prosperity to also serve social purpose at the same time. Within this view, companies are being held accountable by society to newer standards of what it means to be successful. With changing government regimes, diverse consumer demands and dynamic funding opportunities, private companies interact with continually changing stakeholders in many ways. 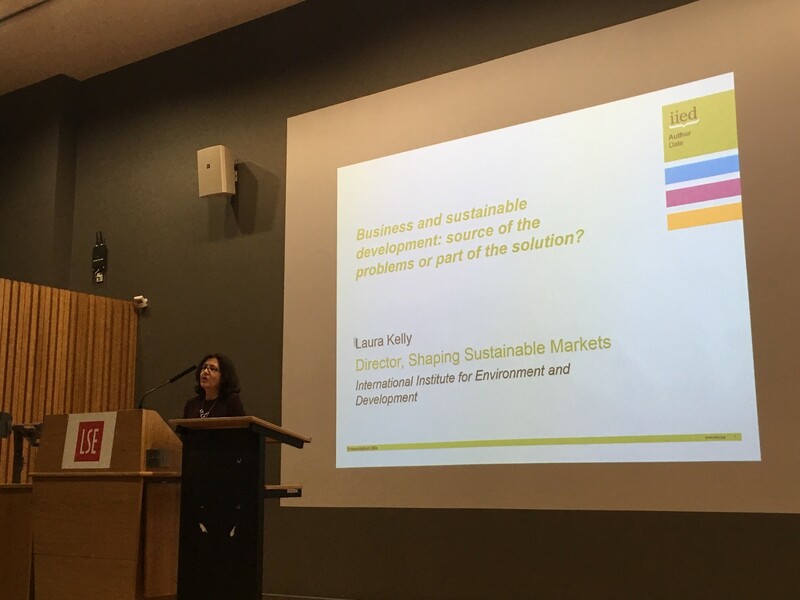 By noting the roles and interests of these players, Laura argued that each of these stakeholders can be key to encouraging private companies to become ‘development-friendly’. Governments can use the ‘carrot and stick’ method of motivating companies to change to sustainable practices. By encouraging responsible and inclusive business practices with an emphasis on innovation, governments can push the private sector to take on roles of societal responsibility while also setting norms on good environmental practices and labour norms. Consumers, which form the main area of profitability for companies, are already demanding products that are made sustainably. As employees, millennials also look towards companies which have a development agenda in their operations. As a result, Fairtrade products have gained popularity and companies such as Accenture and GSK are integrating a development approach in both their profitable and not for profit endeavours. By preferring to fund companies which integrate sustainability in their operations, tools of development impact bonds and impact investing motivate companies to invest in sustainable practices and differentiate themselves through not only how well they can achieve their goals, but also how good they are at ensuring that this growth is inclusive. Listeners in the audience raised several pertinent questions regarding discerning consumers, the role of the informal private sector and whether corporate growth is antithetical to green growth. While sceptics might emerge from the Sheikh Zayed theatre halls with questions in their mind, all would agree that the approach of finding the right incentives within a paradigm of pragmatism might hold potential for a new sustainable market economy. Currently pursuing an MSc in Health and International Development at LSE, Eman Rahman holds previous experience as a public health consultant working on women and child health and nutrition issues. She holds keen interest in the role of the private sector in health systems strengthening and envisions a renewed duty of the private sector in developing countries. It was an interesting statement from Laura Kelly on Friday, as students and young people were marching outside the campus for the Global Climate Change Strike. Inspired by the 16-year-old Greta Thunberg who was nominated for the Nobel Peace Prize this weekend, they demanded radical change to tackle the climate crisis. Indeed, we witness a rising sustainability trend among the younger generation, from wearing clothes with ethical standards to eating less meat to participating in the no plastic campaign. As she talked a bit more about ‘companies with purpose’, there was a strong message that doing good was still viewed as not obligatory, but rather voluntary. Technological innovation is central to these sustainable businesses, such as developing solar panels or mobile money to tackle inequality. It cannot be denied that they create jobs and contribute to better livelihoods! Sustainable business has an interesting element of hybridity, either as a corporate or social enterprise. They are pushing towards two missions, social and financial gain, which could be conflicting at times. Kelly gave an example of an FMCG business that is now contributing to building roads so it could reach more rural areas, thereby creating a more economically viable distribution mode. This seemed profitable and financially viable for business. However, this could create a new dependency towards mass-produced goods, instead of empowering community businesses and incentivise locally made sustainable products. We need to be careful about interpreting these efforts as it could depoliticise the root cause of inequality and make the conversation more about finance or economy, rather than the political constraint. When businesses interfere in all aspects of livelihood and contribute to GDP, they are at a better position to negotiate with states. The existing regulations imposing penalties and incentives for sustainability are too limited to hold them accountable. Honestly, there are also too many different multilateral standards and principles to follow, such as those of the UN Global Compact, the Principles for Responsible Investment and Share Action. We need to ensure that sustainability is more than what these certifications say but is reflected into the reality of the targeted communities. Duhita Primandhira is an MSc Anthropology and Development student from Indonesia. She holds an undergraduate degree in International Relations and has worked for several years with Palladium, on DFAT-funded education projects. Her research interest is focused on social policy, education and social innovation in developing countries, particularly within the Southeast Asia region. This Friday, 22 March, we’re already having the last talk of this academic year. Rafeef Ziadah from SOAS will join us to give a talk on “The logistics of violence? Dubai and the making of global humanitarianism”. The lecture takes place from 4-6pm in the Sheikh Zayed Theatre in the New Academic Building. The series is open to LSE Students and Faculty. Other external guests should visit https://bit.ly/2AxvWVG to reserve a seat.